Company visit at Drukpol, a leading Polish packaging printer. 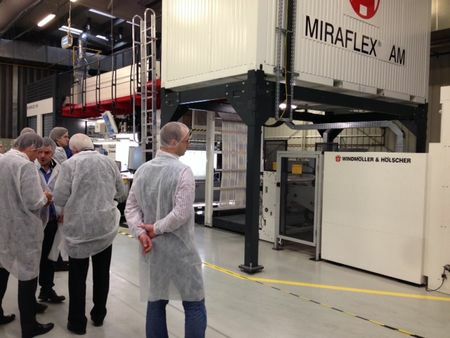 The roadshow „Image-to-Print“ commonly set up by Windmöller & Hölscher, Sun Chemical, Nordmeccanica and Janoschka went on: recent stop-over was close to Warsaw, Poland. The set goal of the very successful roadshow, touring already since 2009, is to support local printers, converters and brand owners in the rotogravure and flexo industry, and to provide an insight to gravure and flexo printing best practice and future developments. The workshops present market trends, strategies and latest technical developments in inks, printing formes and rotogravure and flexographic printing presses as well as laminating equipment, and offer a great stage for expert discussions. The local market needs and its support are a major issue of the conference as well. Part of the agenda in Poland besides presentations and exchange was the visit of the Polish packaging printer Drukpol who offered insight into its running print production on WINDMÖLLER & HÖLSCHER MIRAFLEX AM and laminating on NORDMECCANICA DUPLEX COMBI LINEAR. The Image-to-Print conference in Poland was the twelfth roadshow stop after previous stopovers in Russia, Malaysia, Thailand, Brazil, Argentina, Dubai, Mexico, Indonesia, China, Vietnam and Italy. Upcoming destinations in important rotogravure and flexo markets include venues in America and Asia. For further information about “Image-to-Print”, you may visit www.image-to-print.com or get into contact with the organisation team.